2001. Age is catching up with Robert Finlay, a police officer on the Royalty Protection team based in London. He s looking forward to returning to uniform policing and a less stressful life with his new family. But fate has other plans. Finlay’s deeply traumatic, carefully concealed past is about to return to haunt him. A policeman is killed by a bomb blast, and a second is gunned down in his own driveway. Both of the murdered men were former Army colleagues from Finlay’s own SAS regiment, and in a series of explosive events, it becomes clear that he is not the ordinary man that his colleagues, friends and new family think he is. And so begins a game of cat and mouse a wicked game in which Finlay is the target, forced to test his long-buried skills in a fight against a determined and unidentified enemy. Wicked Game is a taut, action packed, emotive thriller about a man who might be your neighbour, a man who is forced to confront his past in order to face a threat that may wipe out his future, a man who is willing to do anything to protect the people he loves. But is it too late? Despite my recent flurry of reviews of more traditional crime books, I must confess that I have a bit of a soft spot for a good, fast-paced action thriller. Matt Johnson’s Wicked Game delivers on all counts. Some background might be useful here (cribbed from the press release). Matt Johnson served as a soldier and Metropolitan Police officer for 25 years. He was at the London Baltic Exchange bombing in 1992, and one of the first police officers on the scene of the 1982 Regent’s Park bombing. Matt was also at the Libyan People’s Bureau shooting in 1984 where he escorted his mortally wounded friend and colleague, Yvonne Fletcher, to hospital. While undergoing treatment for PTSD, he was encouraged by his counsellor to write about his career and his experience of murders, shootings and terrorism. 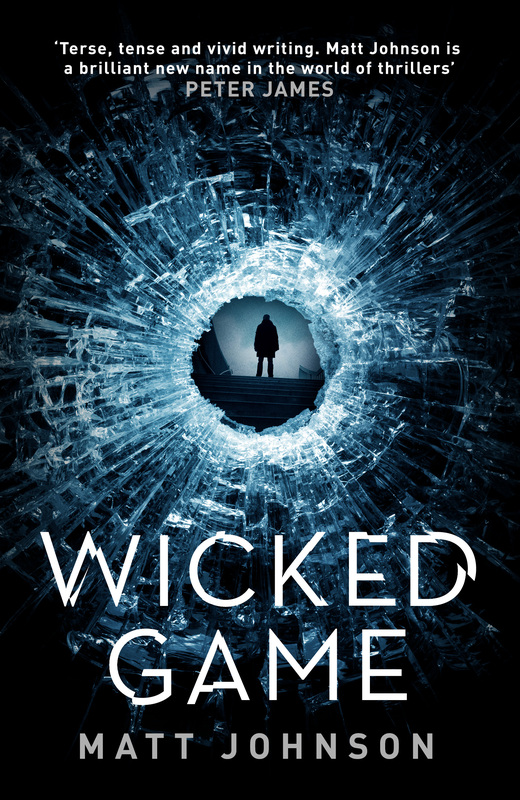 It’s this first-hand experience of these terrible events (more of which you can read about in Matt’s guest post on crime thriller girl’s blog) which really gives Wicked Game an unshakeable feeling of authenticity which is woven deep into the fabric of the story. The prose is taut and to the point, especially when we’re dealing with Finlay and his investigation into the killings and entirely in fitting with the character. The dealings that Finlay has with the various departments looking into the killings feels authentic, and there’s a race against time to see who will get to the bad guys first. What I particularly liked, and what puts the story into a different class for me is that Finlay is no longer the youthful SAS officer he once was and his expertise in planning, which in another thriller would have him disposing of his opponent easily, here is more believably slightly rusty. Things go wrong, and he’s forced to adapt on the hoof, quite literally in some cases! I also liked the way Matt Johnson manages to get you into the mindset of the terrorists. No cardboard cut-out baddies here – these are fully realised and well thought-out with solid, clear, if disturbing, rationales for what they’re doing. I really enjoyed Wicked Game. It’s a fresh, fast-paced and authentic thriller and I’m delighted to hear that Matt is working on a second book. You can read an extract from Wicked Game over at Raven Crime Reads. Wicked Game is published by Orenda Books and is available now. Many thanks to Karen (@OrendaBooks) for the review copy, and to Matt Johnson (@Matt_Johnson_UK) for writing it! As ever, the opinions are entirely my own. 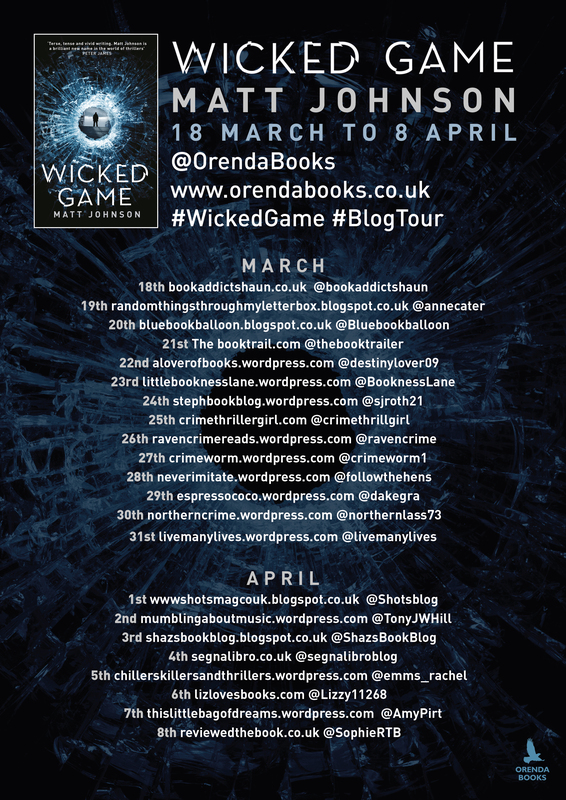 The blog tour continues tomorrow at Northern Crime Reviews with @northernlass73. Dave, many apologies for being late to thank you for taking the time to do this review. Great to hear you enjoyed it. Matt.